Let’s face it; we’ve all been at a business meeting at one point that seemed a bit “off”. 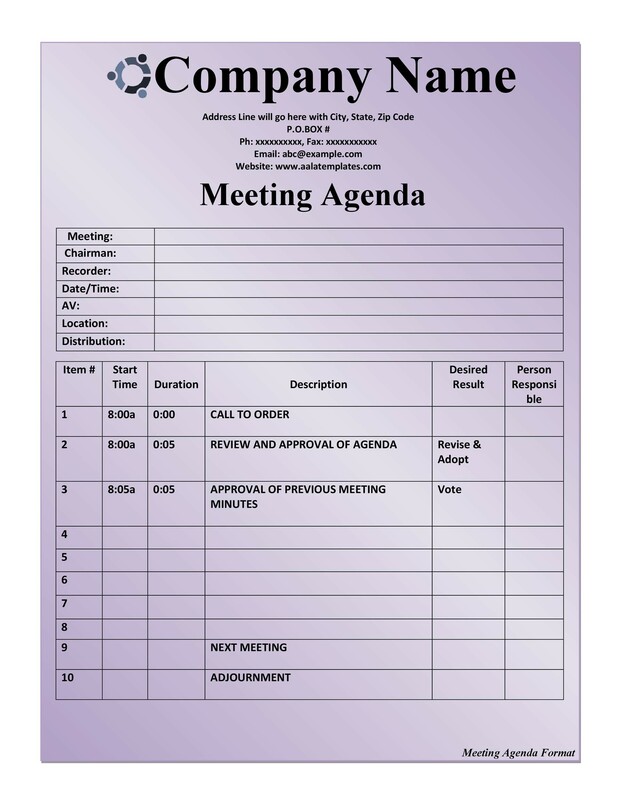 Poorly planned, disorganized and poorly timed meetings can waste a team’s time and make a business look unprofessional. 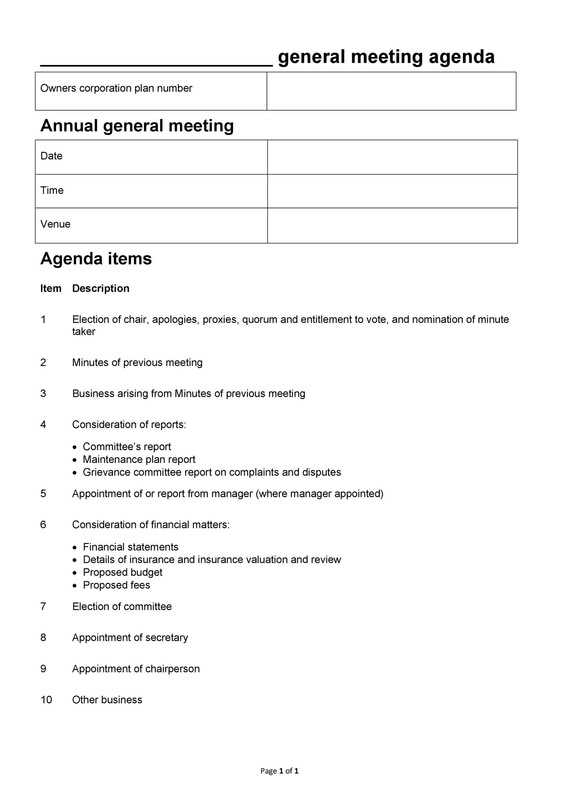 This is where a meeting agenda template can come in very useful; it provides an overview of the meeting’s platform, and lends structure to your planned discourse. 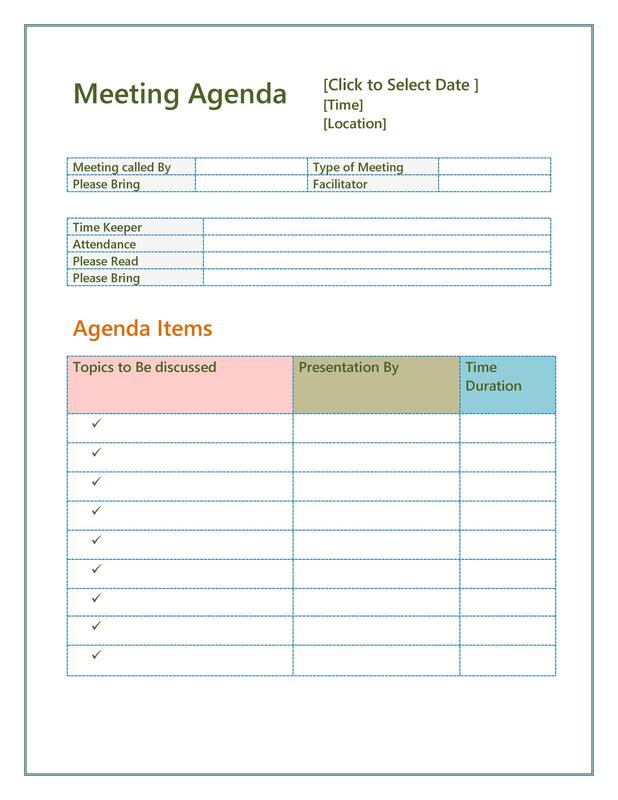 An effective meeting agenda sets clear expectations for the meeting and helps your team members prepare their questions ahead of time. 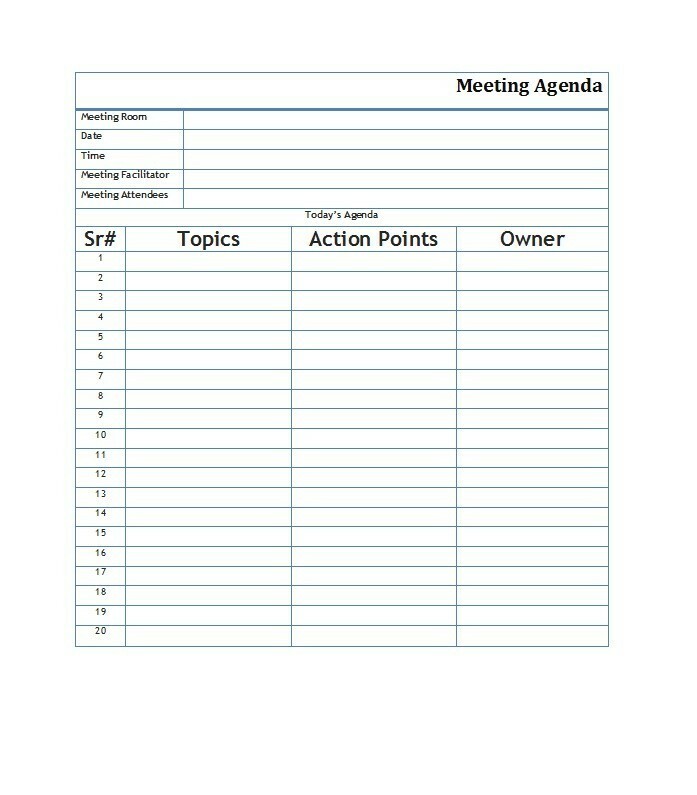 An agenda can help you regain focus if the discussions veer off track, and help you estimate how much time you plan on spending in the meeting. 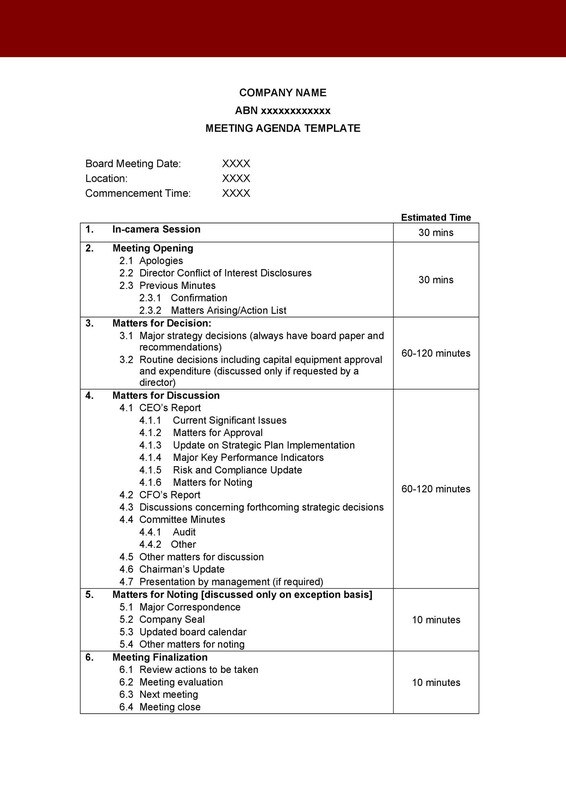 5.1 How Long Should the Meeting Itself Be? 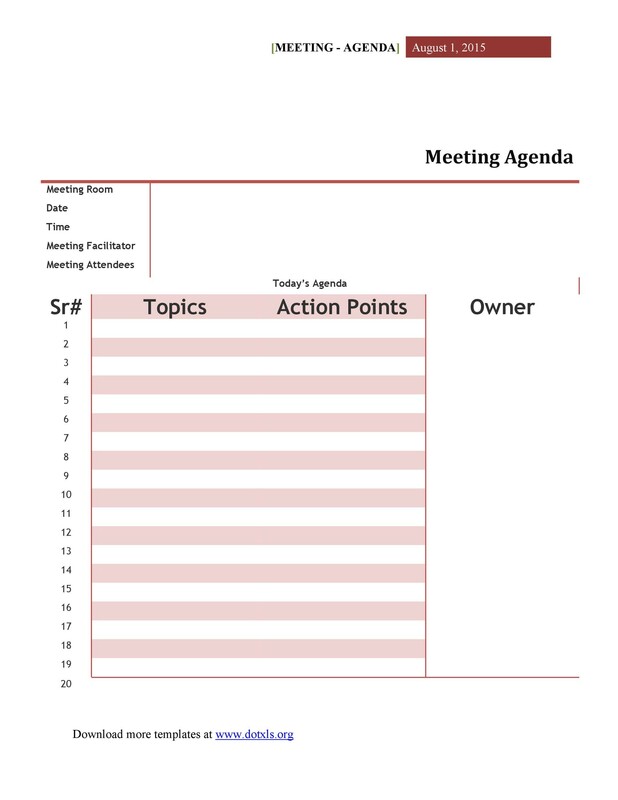 How do you design an effective agenda for your meeting? 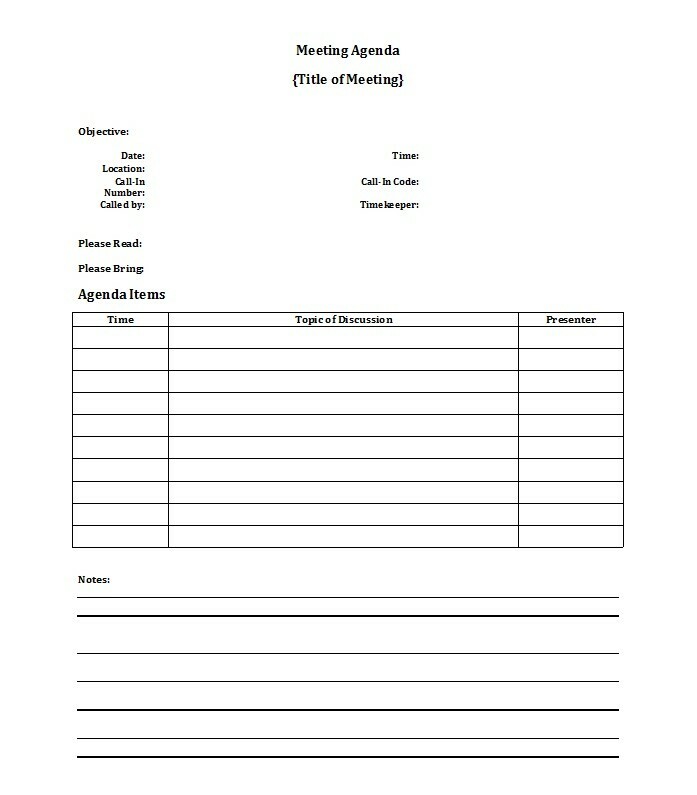 It helps to start with a blank template, which we’ll provide later on this page, and an overview of your goals for the meeting. What do you hope your attendees will get out of it? 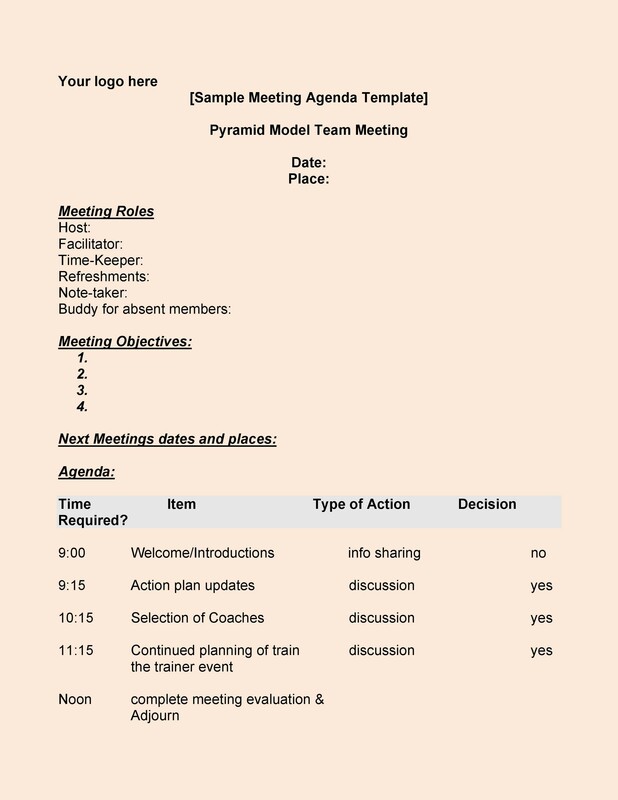 What concrete goals do you have for the meeting? 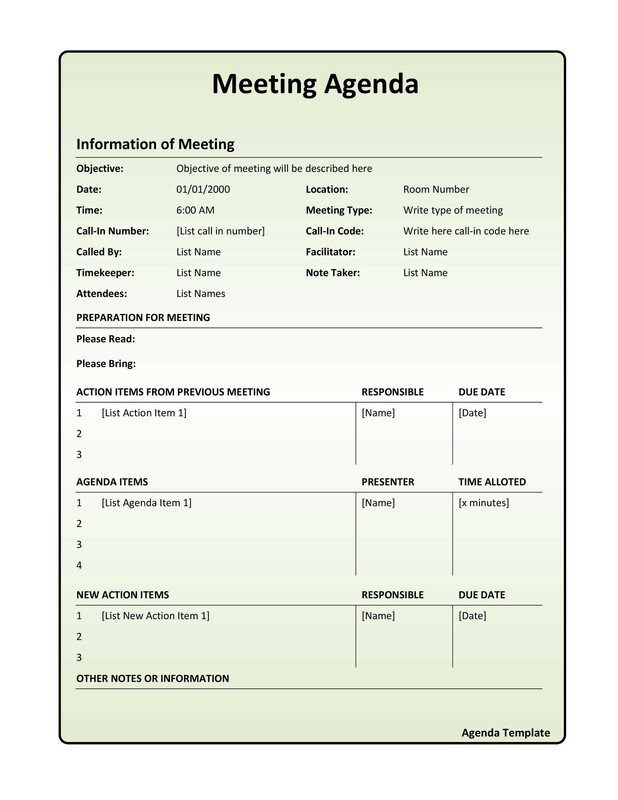 A good meeting takes planning, preferably the kind that includes the employees or attendees that will be attending your meeting. It’s important to seek their input and encourage them to suggest agenda items, and why they think these items should be addressed. (If you don’t use their suggested, you should offer them the courtesy of letting them know why. 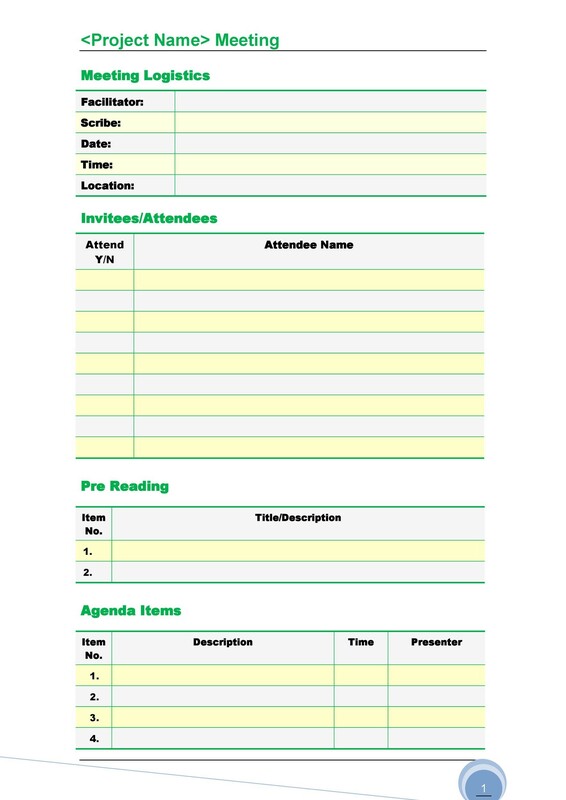 Choose topics that affect everyone in attendance. 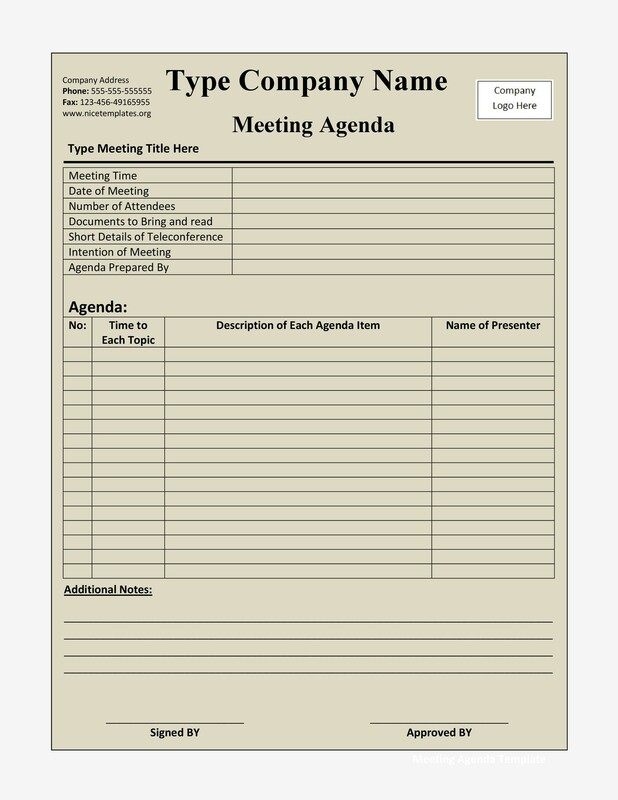 Team meetings take time away from productivity, so stick to topics that affect everyone attending, and call smaller meetings at a later time for other issues that only concern small groups. Most organizations have blanket issues that affect everyone in the office, because they share the same space and tools. For example, if you’re updating the word processing software and need to go over new features for the whole office, a meeting on the basics will be helpful for a large audience. 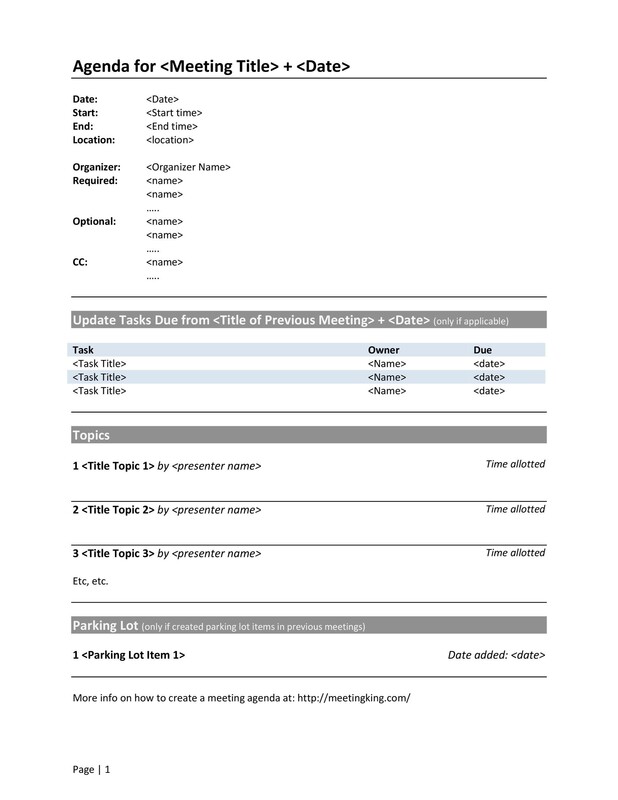 Whatever is not addressed in the meeting can follow-up in the form of a memo. If there are problems with the software package that many departments share, then you should provide them with only one solution that everyone agrees with. 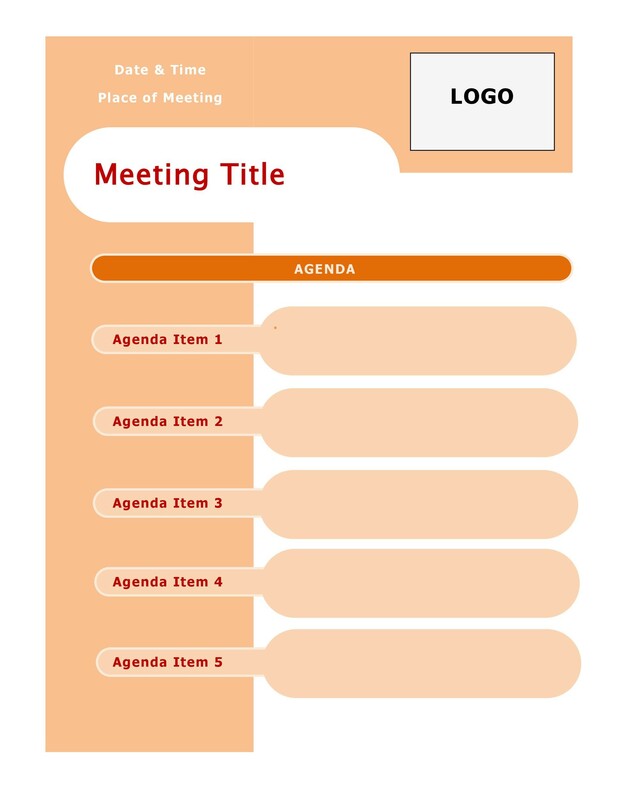 Being “on the same page” is key for your meetings to be successful. 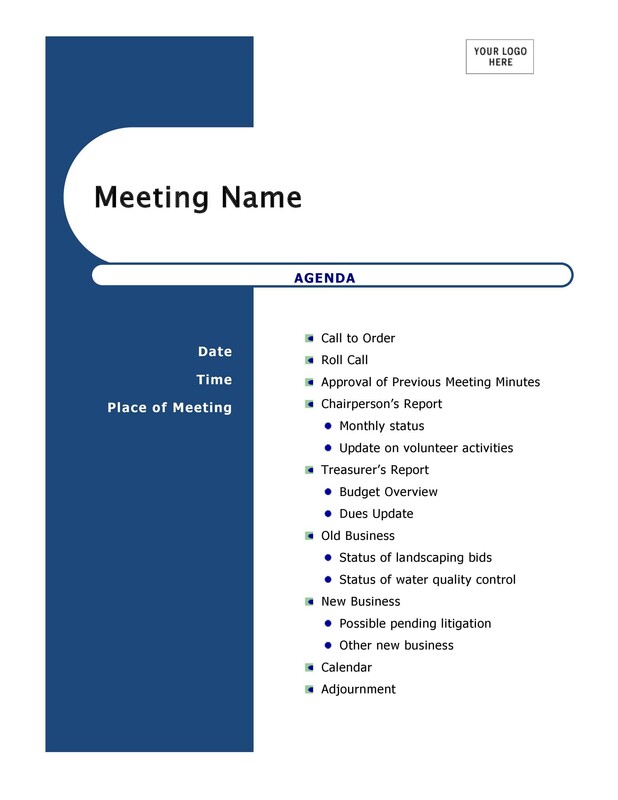 A meeting agenda template typically has a list of topics to be covered, including the name of the person who is going to be speaking on the topic. 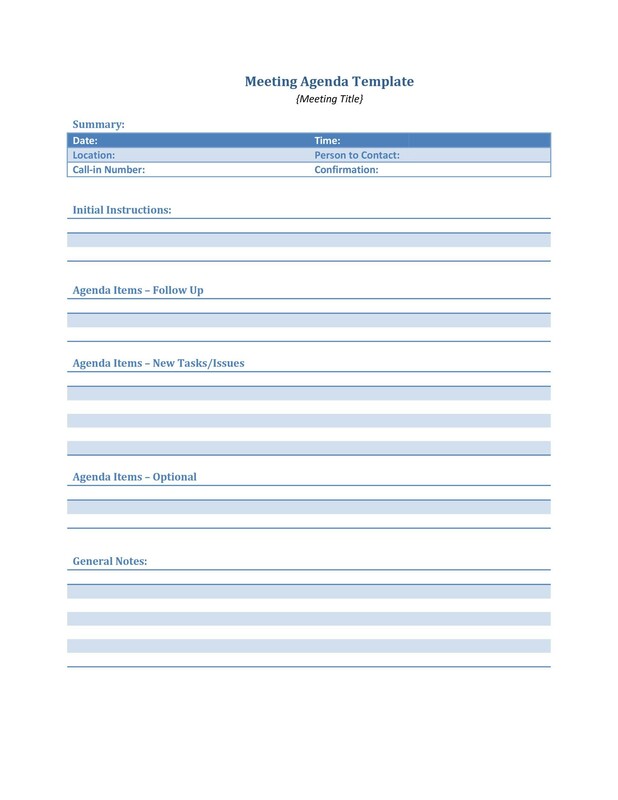 Instead of just using short topics, you may want to list your agenda items as questions and answers. For increased reading comprehension, you may want to list agenda topics as questions the team needs to answer. 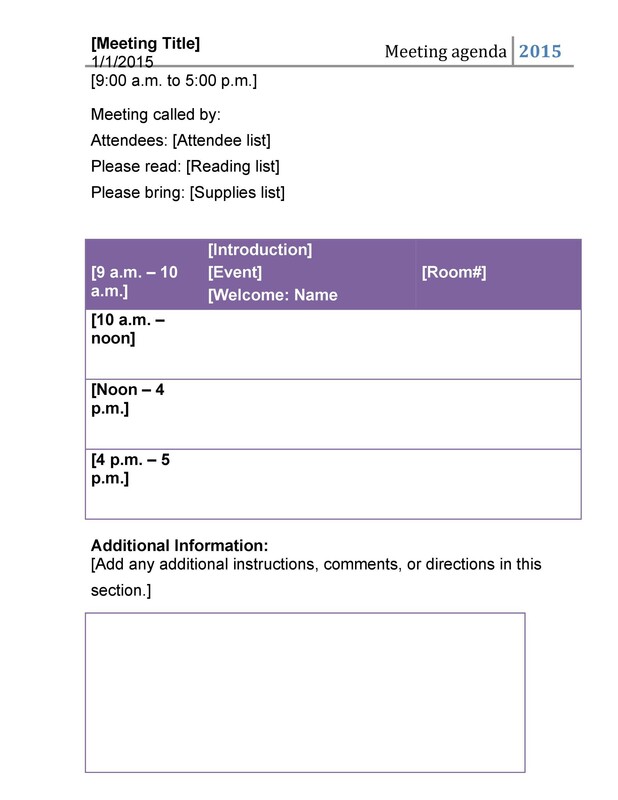 An effective meeting lets attendees know the game plan in advance so they can mentally prepare themselves for it. 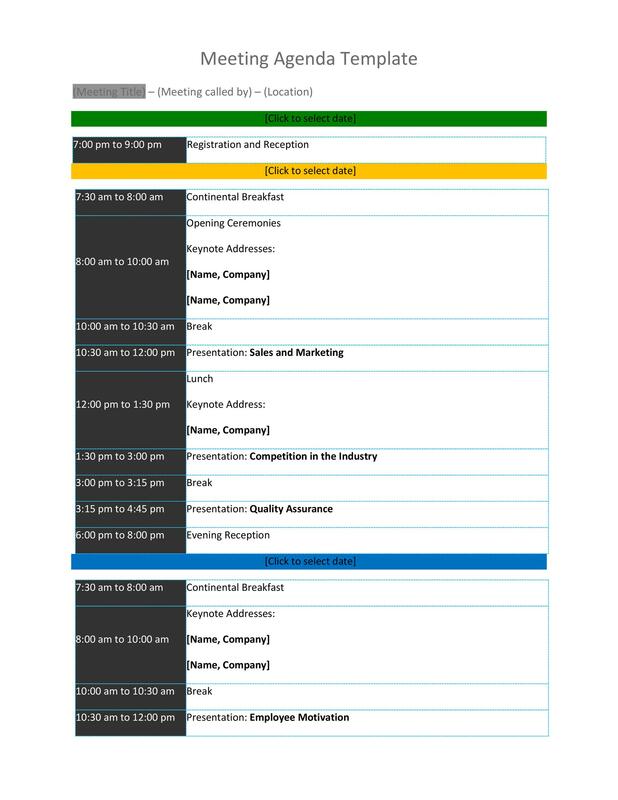 Most agenda topics are simply short notes that don’t really help the attendees understand what’s being discussed. 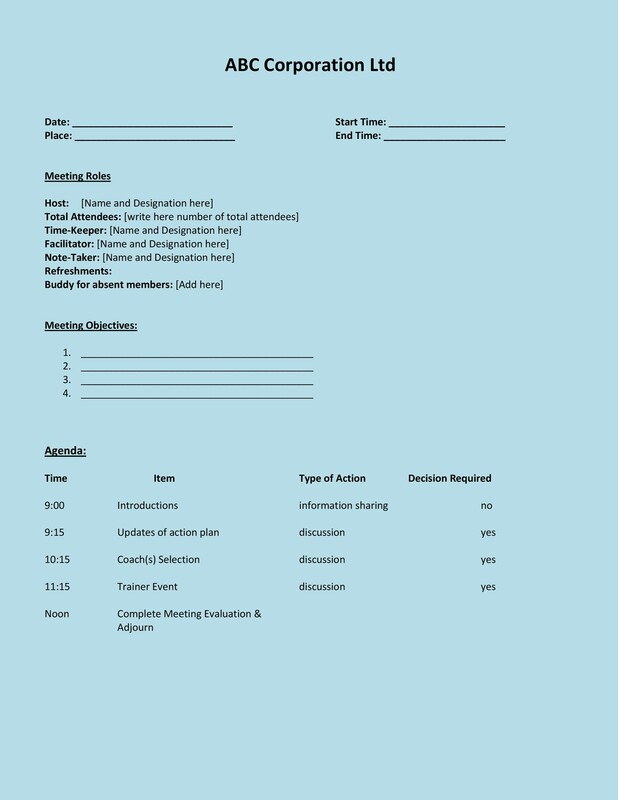 A simple question and answer format on the agenda can save a lot of headaches, and even encourage your attendees to take notes during the meeting itself. 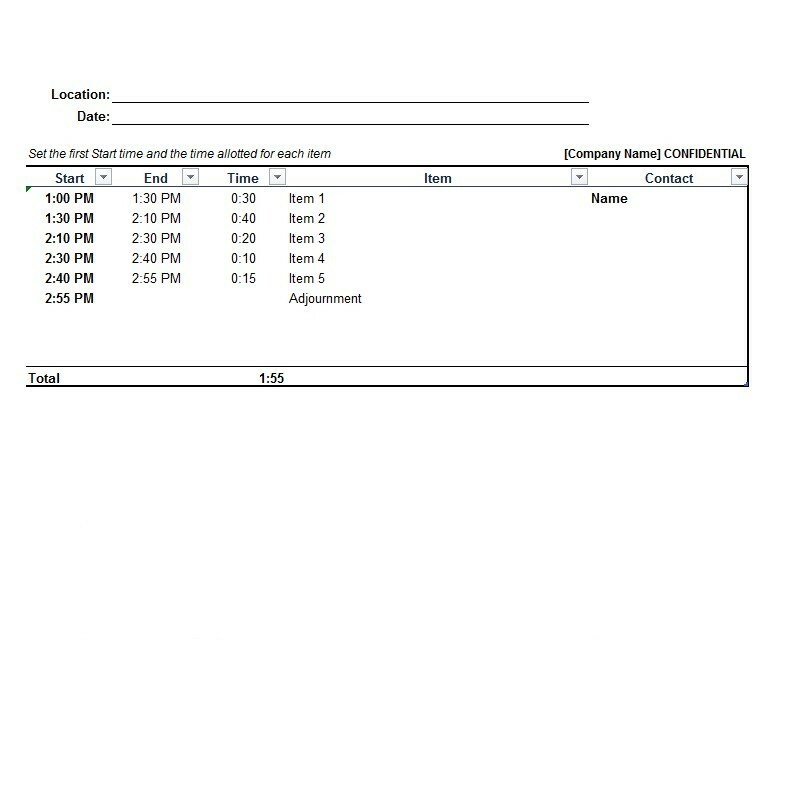 The questions will also help your attending team members think about the topics ahead of time and prepare questions of their own. 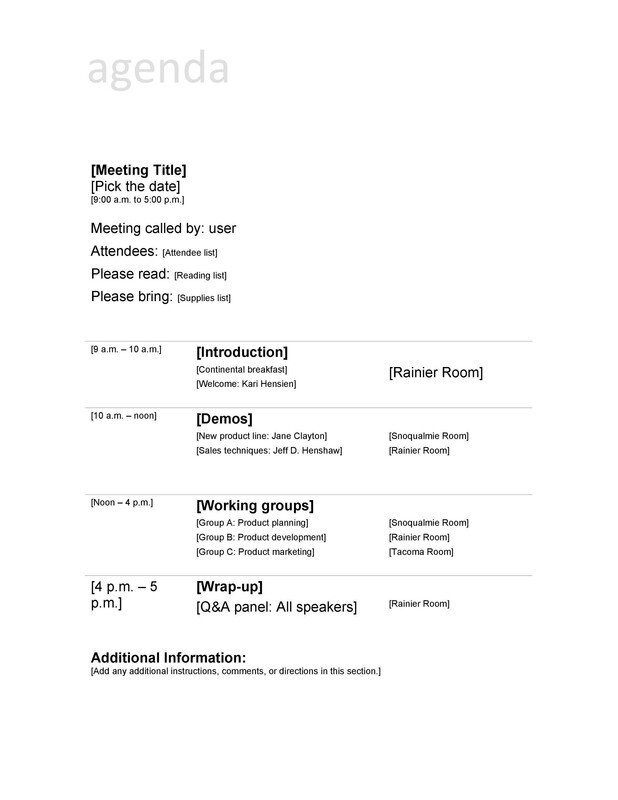 Each meeting agenda item should clearly spell out the purpose of each topic. 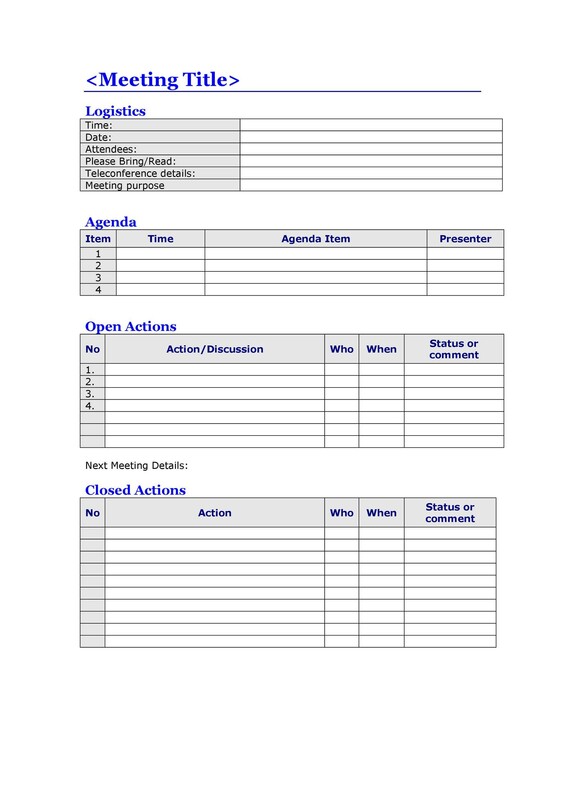 Each agenda item should make it clear if you’re giving out information, seeking input for decision-making purposes, or making an actual decision. 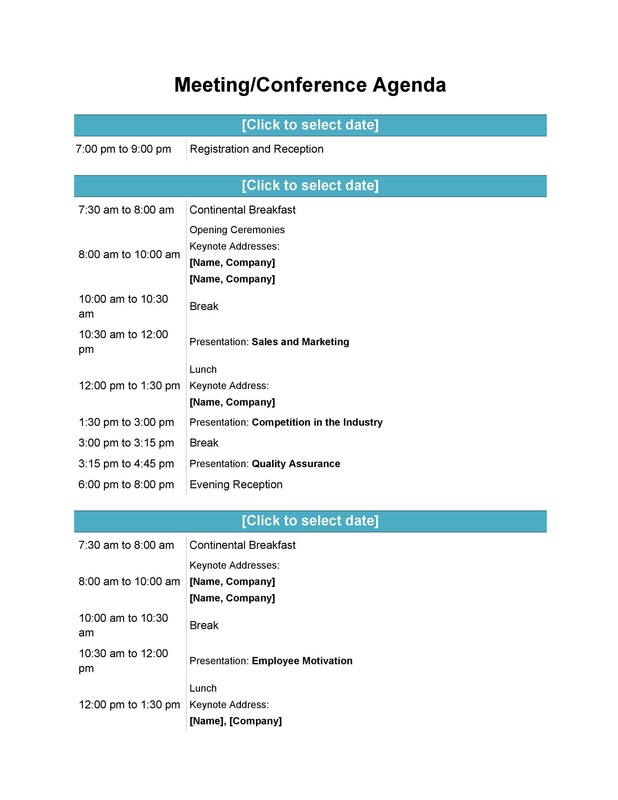 Your attendees will be grateful to know in advance what will be covered, and why their attendance in valuable. 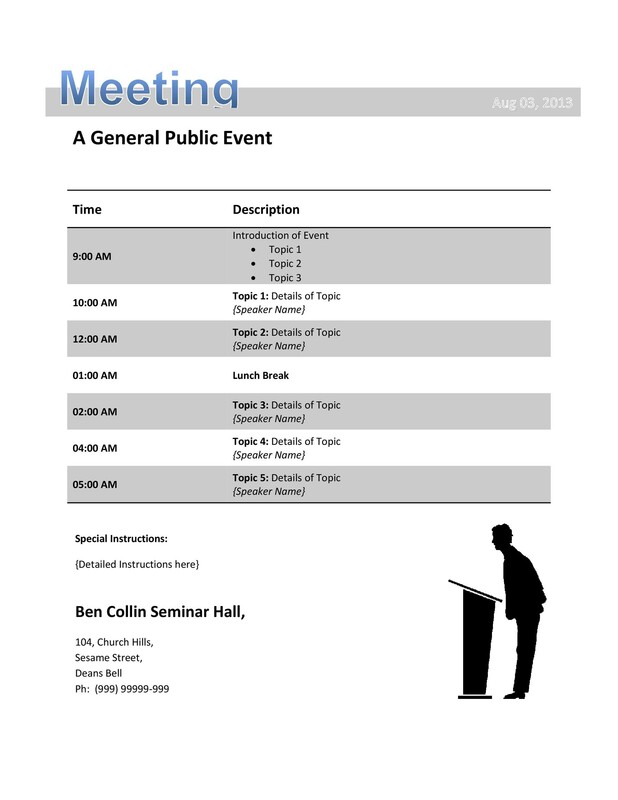 How Long Should the Meeting Itself Be? 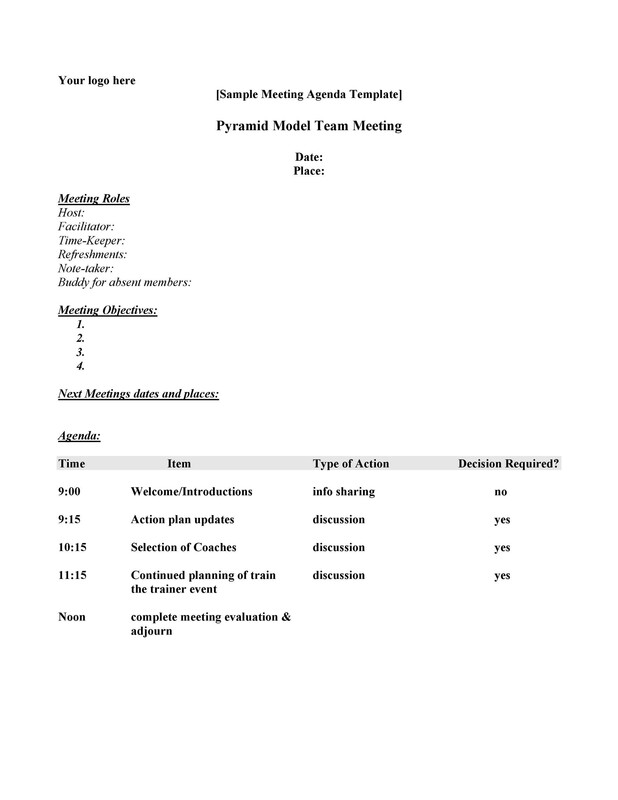 An effective meeting isn’t usually open-ended. It should be efficient and effective. Let’s face it; long meetings can be a chore, and after a while, it gets to be uncomfortable sitting in meeting chairs without a break. 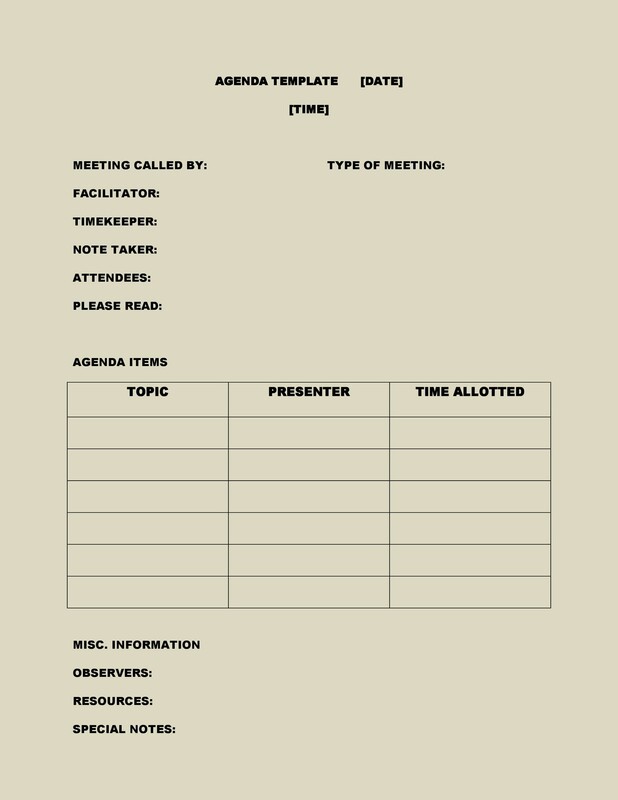 Make sure to plan “break time” into the meeting agenda if you anticipate your meeting will be long. People need bathroom breaks; time to grab a glass of water or to simply stretch their legs. 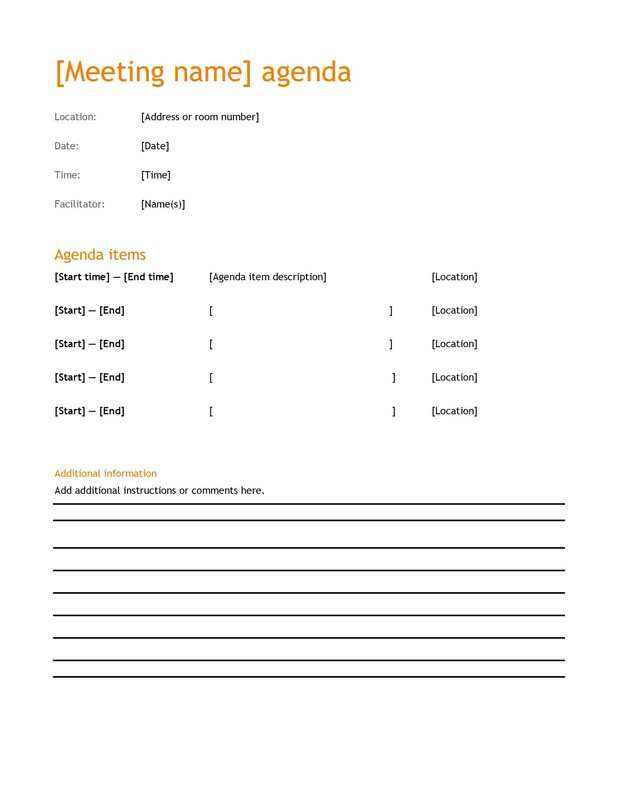 Without these breaks planned into the agenda, you’ll find your attendees get grumpy. 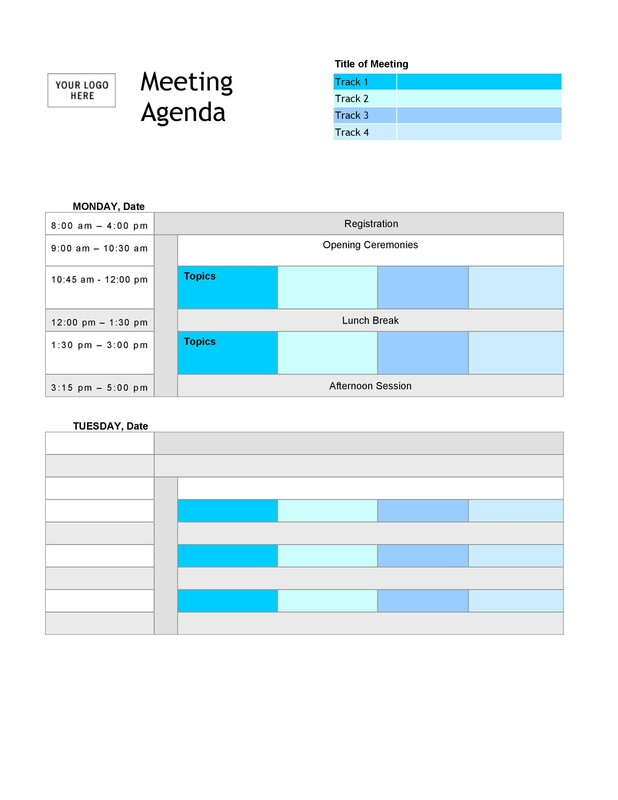 When planning for each topic, you’ll want to estimate a realistic amount of time for each topic. This will help you stay focused and allow you to add time in for questions and concerns. It will also give you the leverage you need to ask somebody to “wrap up” if they’re taking too much time on the floor. The purpose of time limits is to help you stay on-task – don’t worry if your discussion time goes over, but don’t let anyone dominate the conversation you’re having. The idea is to give everyone who wants a chance to speak a chance to do just that. 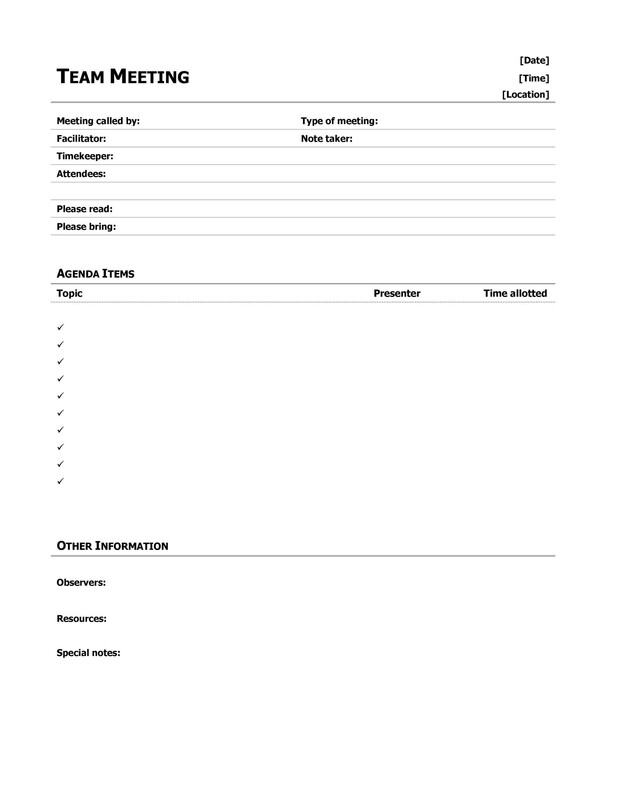 You’ll want your meeting attendees to prepare for the meeting, but did you tell them that when you filled out the template? 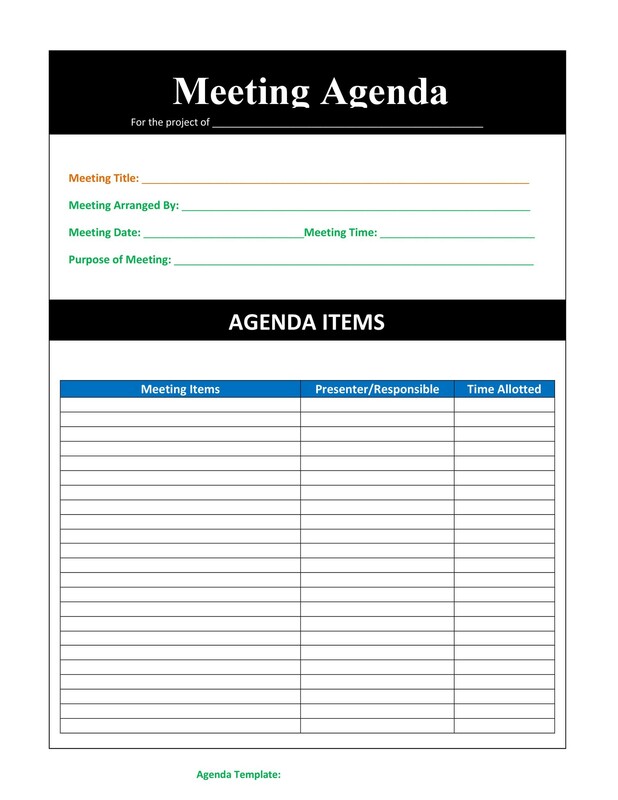 When you hand out the agenda, you should allow ample time before the meeting, so your attendees can do the appropriate research and think about any questions or concerns they have ahead of time. When you write the agenda up, as noted earlier, it’s important to identify who is responsible for leading each agenda item. 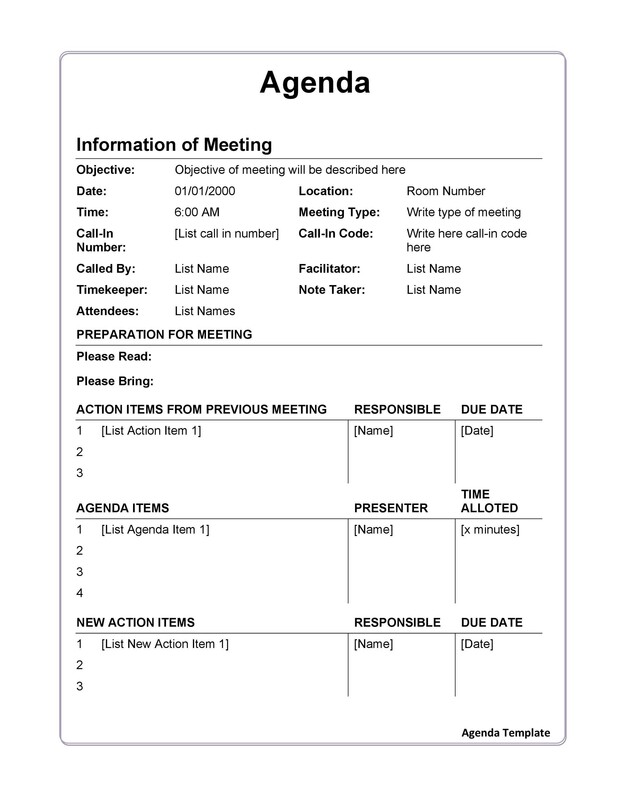 For example, someone other than the formal meeting leader is often responsible for discussing an item. If you’re talking about new computer security policies, you’ll want to have somebody from IT explain the hows and the why’s of it. If you’re switching health plans, you will probably be introducing your Human Resources Manager to explain details and answer questions. 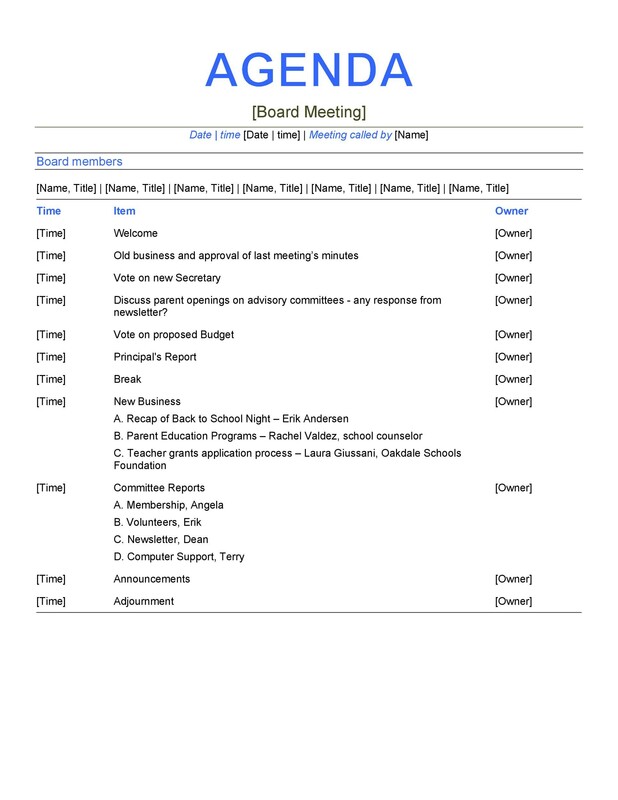 You should make sure to follow up with these people and ask if there are any items that need to be added to the agenda. 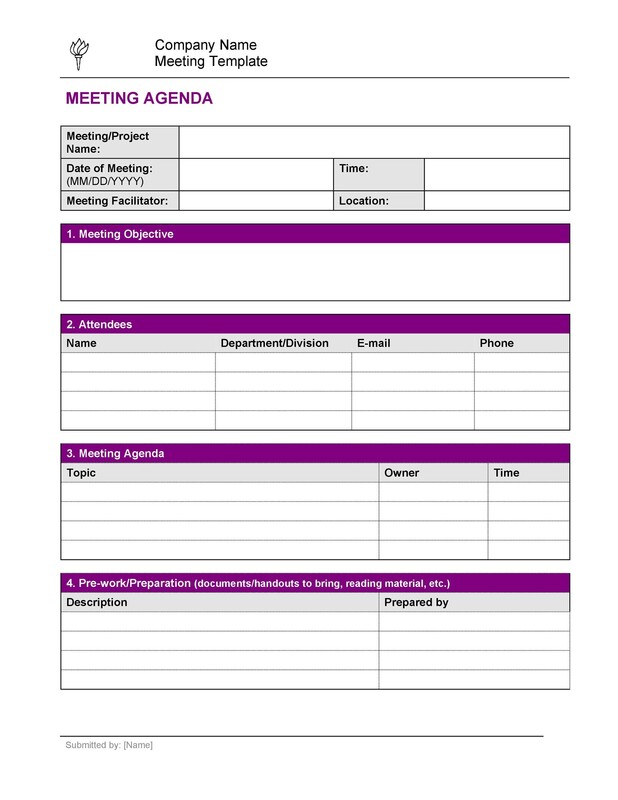 If you have regular meetings, you need to make sure they are as effective and well thought out as possible. 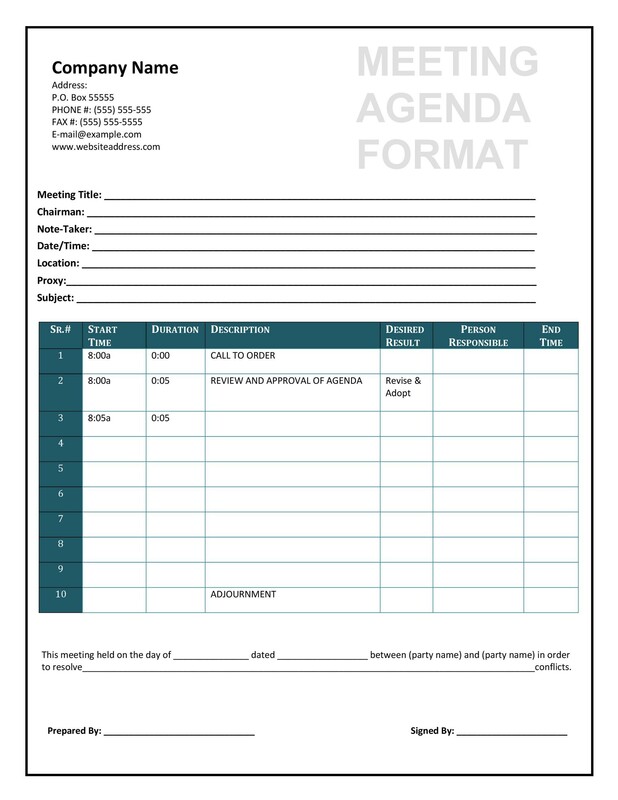 An agenda template is available on this page to help with the planning process. 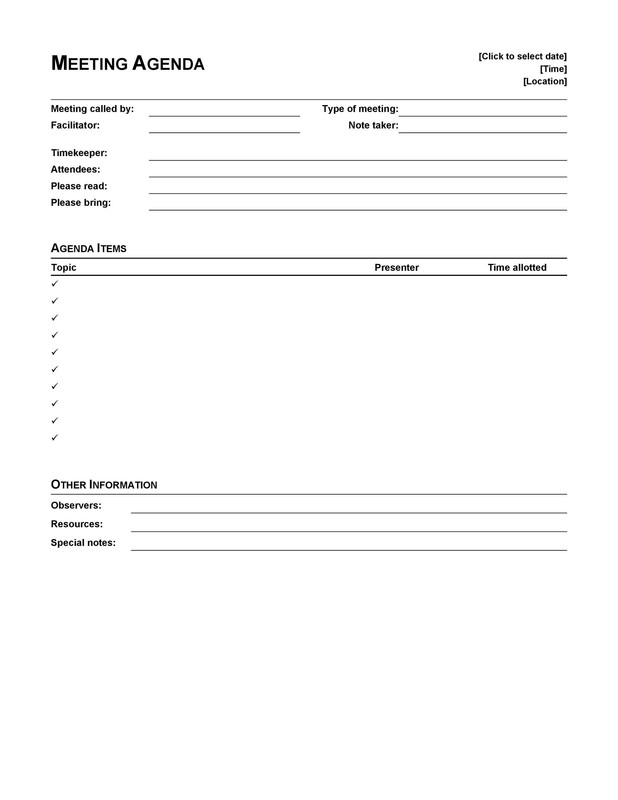 At the end of the meeting, however, you may want to hand out an anonymous questionnaire on the meeting itself so you can improve meeting performances. 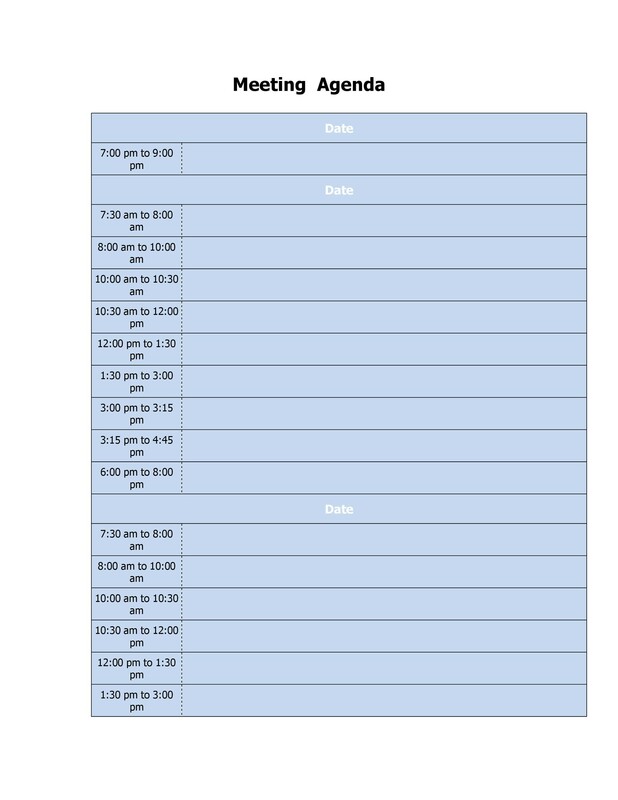 Was the agenda sent out to everyone in time for them to prepare? 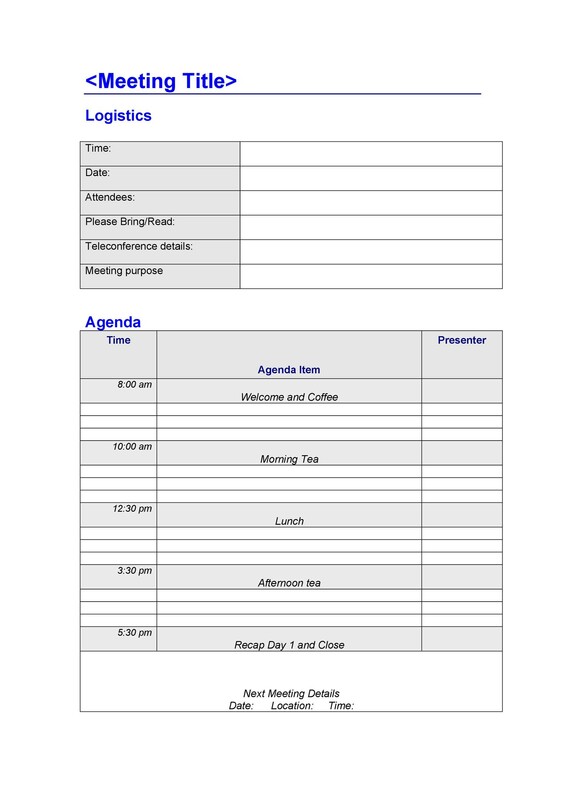 Did the attendees feel like the agenda items were well organized? Were handouts easy to read and understand? Were we able to make good decisions based on our discussions? 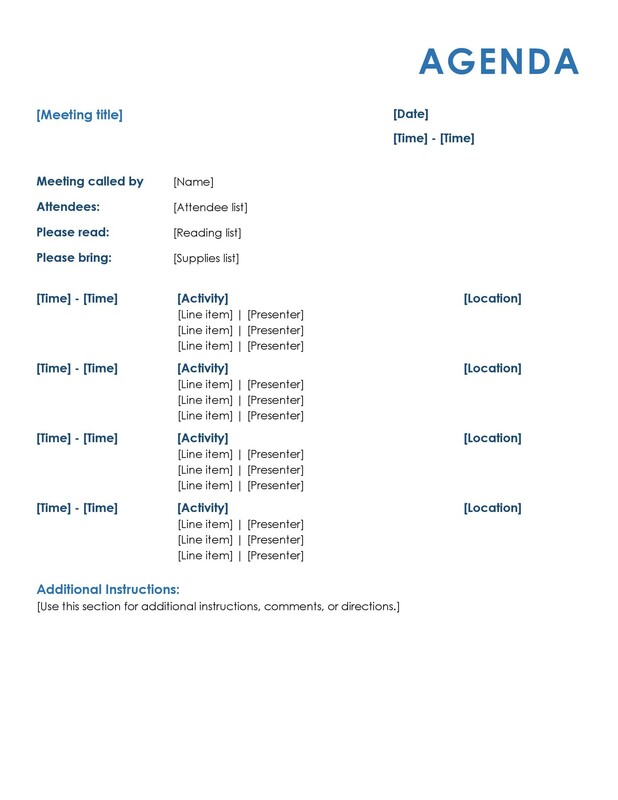 How effective was the meeting’s use of time? 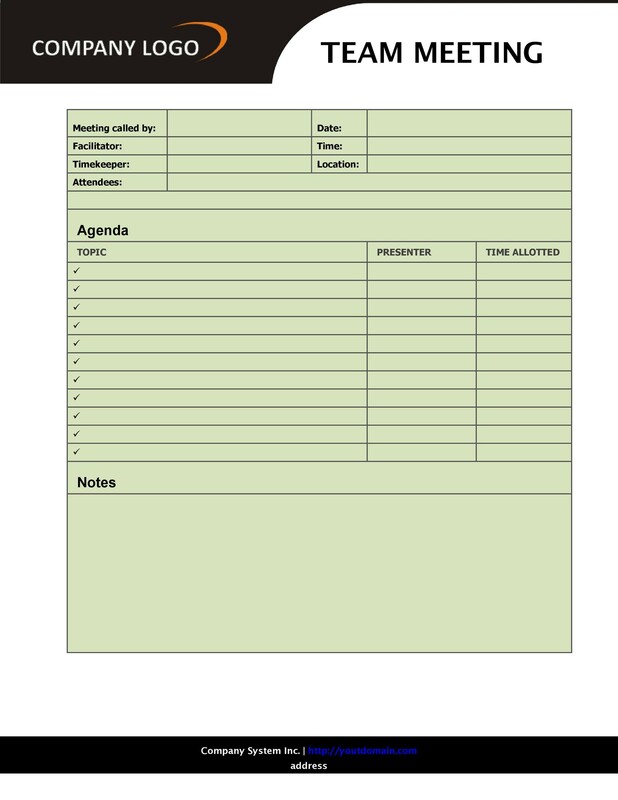 Were all the agenda items covered in an easy to understand manner? 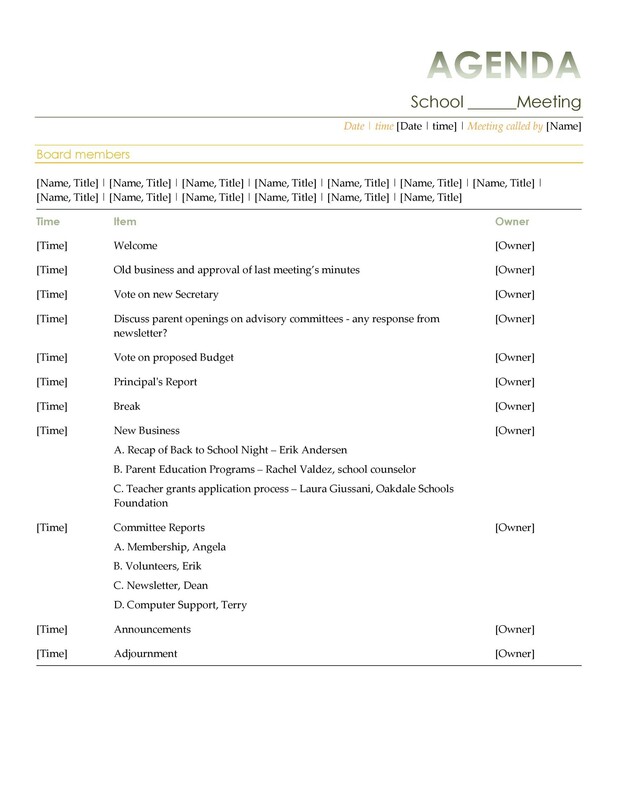 What is one thing you would change about the meeting? 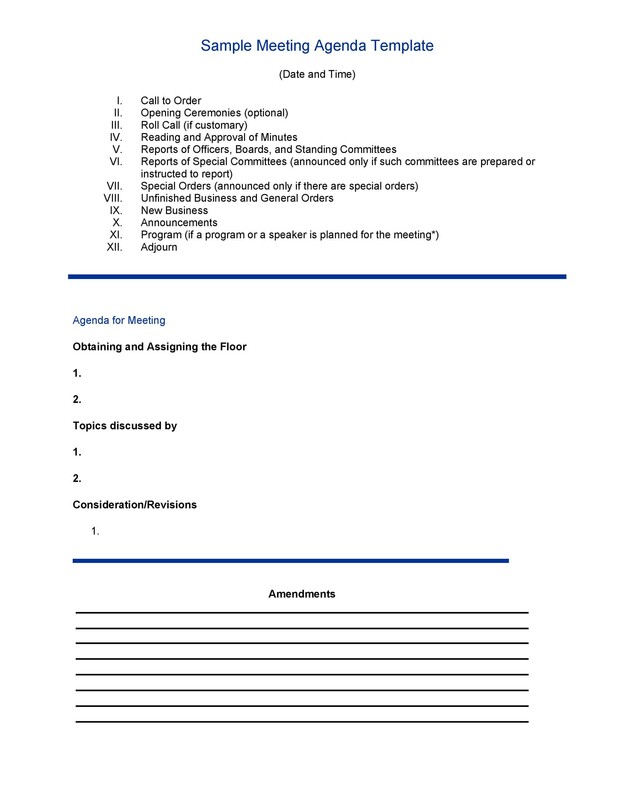 Did this meeting contribute to your understanding of the agenda items? 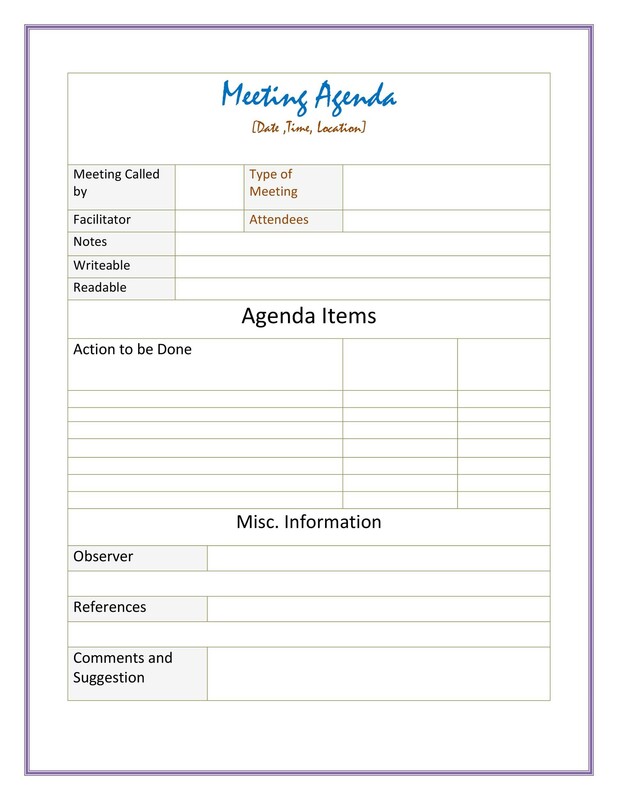 Not every meeting will go smoothly or perfectly, but with a well-planned agenda, you can help plan and create effective meetings that will be rewarding for everyone involved. 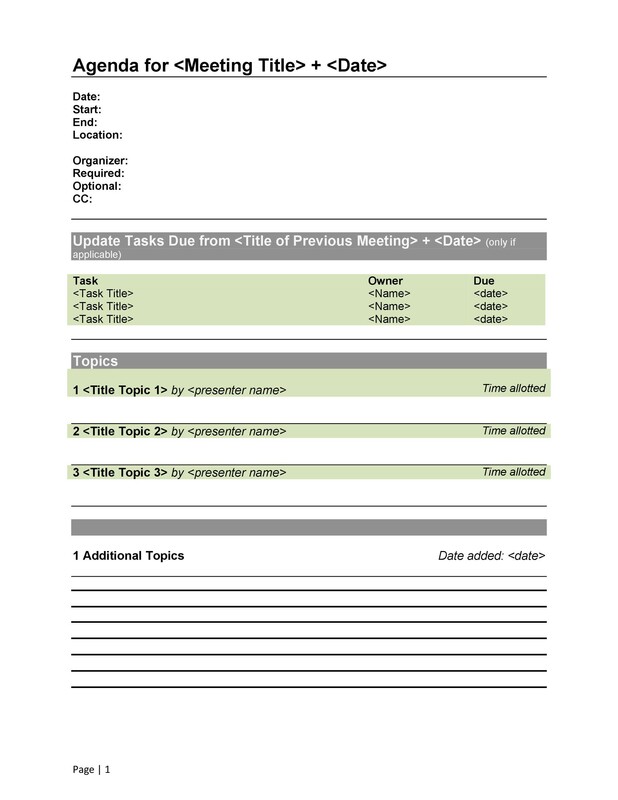 Make sure you download our template to help you plan!